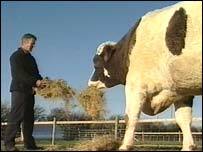 A 12ft long bullock which weighed in at 1,660kg (261.4 stones) at a Somerset cattle market could be the biggest in Britain. Arthur Duckett had been offering a reward to anyone who could guess the weight of his six-year-old steer Colonel. The bullock was saved from slaughter aged two by Mr Duckett and his wife Helen, and since then has lived at their fields in Alstone Wildlife Park in Highbridge. On Monday they took him to the town's cattle market for an official weigh-in, to find out just how heavy he is and to raise money for charity. People had to pay £1 to guess Colonel's weight and the stunt generated £1,100 for a local cancer charity. The bullock's trip to market is likely to be his last as there are no plans to sell him for slaughter. "He won't go anywhere unless something happens to him - he will live out the rest of his life in the field," Mrs Duckett said. "We are very fond of all our animals." Colonel shares the 22-acres at Alstone with several other rescued animals including a camel, wallabies, emus and a herd of deer.